LONDON (Reuters) - British Prime Minister Theresa May is under growing pressure from within her Conservative Party to lead Britain out of the European Union in the next few months, even if it means a no-deal Brexit, The Sun newspaper reported. 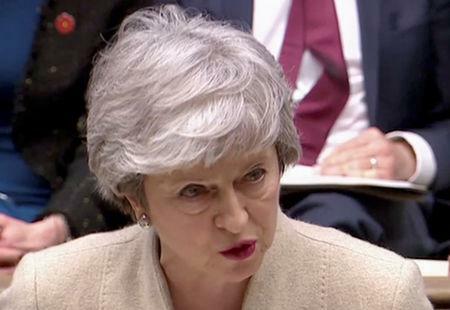 A letter signed by 170 of the 314 Conservative lawmakers in parliament, including 10 cabinet ministers, was sent to May after her Brexit deal was rejected for a third time by the House of Commons on Friday, the newspaper reported. 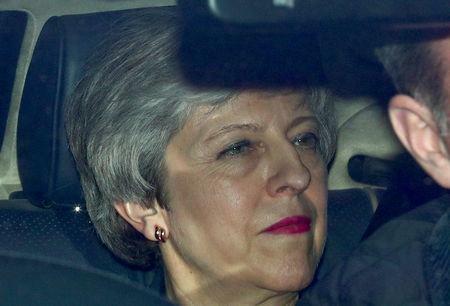 The vote left Britain's withdrawal from the EU in turmoil on the day that the country was originally due to leave the bloc. May has raised the prospect of a long delay to Brexit because of the deadlock in parliament where she does not have a majority. Many of her own lawmakers have long demanded a more immediate break from the EU. Britain has less than two weeks to convince the 27 other EU countries that it can solve the impasse, or risk leaving the bloc on April 12 with no deal to soften the economic shock. "We want to leave the EU on April 12 or very soon afterwards," The Sun quoted a Brexit-supporting minister as saying in reference to the letter. A spokeswoman for May declined to comment on the letter. The Conservative Party's chairman Brandon Lewis said he was aware of it but had not seen it. 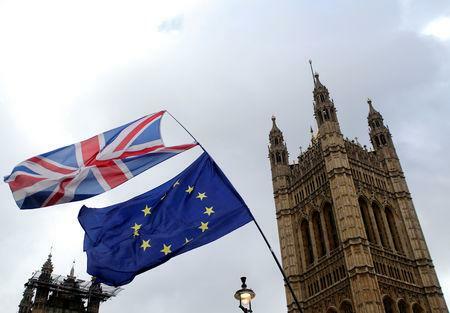 The 650-seat lower house of parliament has voted overwhelmingly against a no-deal Brexit but its view is non-binding. On Monday, lawmakers will try to agree on an alternative Brexit plan. The options that have so far gathered most support involve closer ties to the EU and a second referendum. Lewis, the Conservative Party chairman, said all options were on the table but that a customs union with the EU -- an idea backed by the opposition Labour Party and some Conservatives -- would be difficult. "We've got to look at what we can do next and we have to do something different," he told BBC radio when asked if May might try to put her withdrawal agreement to a parliamentary vote for a fourth time. "Parliament will continue this process on Monday and we've got to look at all the options." A customs union would fly in the face of the Conservative Party's pledges before the 2017 national election and would not respect the outcome of the 2016 Brexit referendum, Lewis said. When asked if a way out of the impasse was to hold a fresh national election, he said he did not think British voters wanted to return to the polls. Watch Out, U.K. Conservatives. Nigel Farage Is Coming After You.